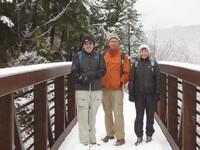 Well, instead of snowshoeing as had been on the schedule, we went out to Applegate Lake. 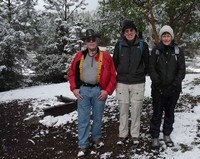 We drove to the Dagelma trailhead (uphill from the French Gulch trailhead). We hiked down Osprey to the Payete trail and past both Hal’s point and Hank’s point to a point three miles from the bridge. It began snowing fairly well when we stopped for lunch and about half the way back. We did have uphill the last half mile of our hike.